The flying lemur is one of the few mammals that exhibit the evolutionary gift of aerial locomotion. However, the flying lemur does not necessarily “fly” from one place to another, rather it glides through the rain forests of tropical Asia. This ability to glide is due to a thin, blanket-like membrane that extends between its front and hind limbs. This unique feature is also prominent in the flying squirrel, with the only difference being that the tail of the lemur is attached to the thin membrane used to glide. 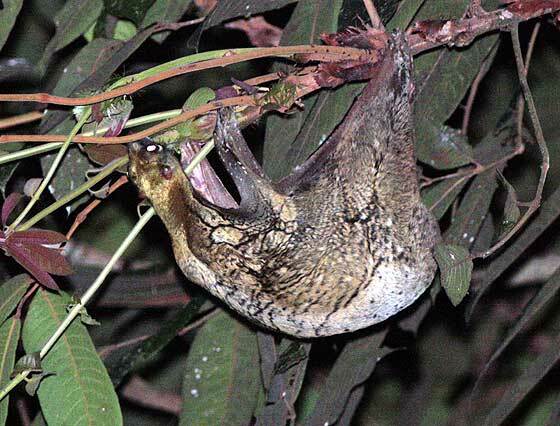 When the flying lemur wants to glide, it first uses the tree limb to launch itself out, then holds out its arms and legs and the membrane that extends from them, begins to have a parachute-like effect. Typically, the flying-lemur glides from 50 to 100 meters. However, the longest recorded glide distance of the flying-lemur is about 136 meters.If you thought how they glide is cool, their landing is probably even better! As they begin to descend, the flying -lemurs actually pick their head up, and land with all four limbs clenched on to a tree limb( that sorta reminds me of my neighbor’s cat). The flying lemur usually glide to escape predators(most notably the Philippine Eagle) and search for food at times of scarcity. In addition to gliding to escape predators, they are also nocturnal, which helps limit the amount of competition they may face from non-nocturnal species. The animal, that would be closely compared to them would be the bat. It is obvious really. They are both animals that glide, hang upside down, are nocturnal, and are mammals that have evolved to master aerial locomotion. Unfortunately, the lemur has recently been listed by the IUCN as a vulnerable species. Due to habitat destruction and predators, there are only 2 species of flying lemurs left. A truly tragic fate for such fascinating creatures.